Its main exports are oil, livestock, and cotton. Its major import partners are France, China, and Cameroon. Its major imports include machinery and transportation equipment, and industrial goods. Located in Central Africa, Chad has a 6,406.00 km border with Cameroon (1,116 km), Central African Republic (1,556 km), Libya (1,050 km), Niger (1,196 km), Nigeria (85 km) and Sudan (1,403 km). Since 2003, ad hoc armed militia groups and the Sudanese military have driven hundreds of thousands of Darfur residents into Chad. The capital of Chad is N’Djamena, which is located across from Cameroon along the southwestern border of the country. This city constitutes its own special statute region, which is divided into 10 administrative divisions known as arrondissements. The population of N’Djamena is around 1,092,066, although the entire metropolitan area has a population size of over 1.6 million individuals. The population here is ethnically diverse, with more than half of the individuals here under the age of 15. N’Djamena is often the first point of entry into Chad. Tourists here may enjoy walking along the river, observing its many mosques, or visiting the National Chad Museum. Additionally, N’Djamena is home to both the National Assembly building and the presidential palace. This city is located in a semi-arid climate zone and experiences a 4-month long rainy season. During this time, the city receives just over 20 inches of precipitation. Between March and June, temperatures here can reach over 100° Fahrenheit. Chad is an African country covering 1,284,000.00 km2 of which 1.93% is water and 1,259,200.00 km2 is land. This makes it the 20th largest country in the world and almost nine times the size of New York state; slightly more than three times the size of California. Its geographic coordinates are 15 00 N, 19 00 E and N'Djamena is the capital city. The country is named for Lake Chad. Its ISO code is TD. Chad has a mean elevation of 543 m above sea level. It has a tropical climate in the south and an arid climate in the north. Its terrain consists of arid plains in the center, desert in the north, mountains in the northwest, and lowlands in the south. 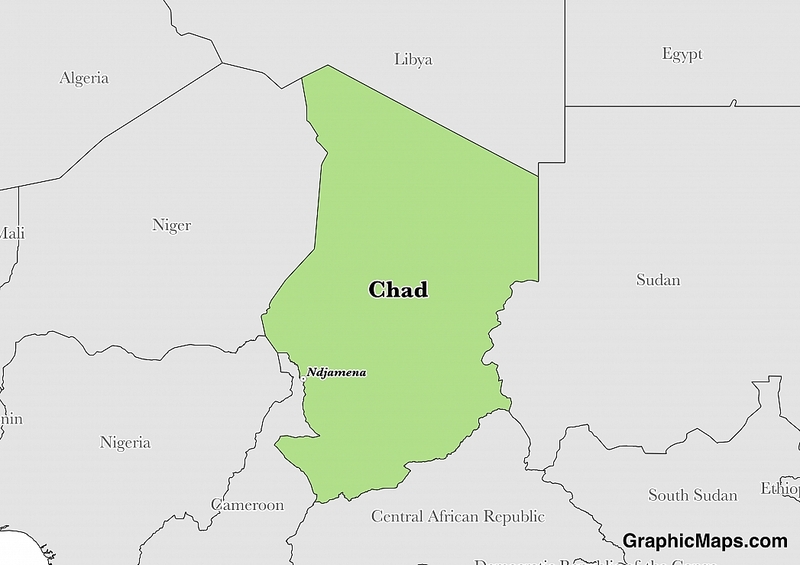 Chad has a population of 11,852,462 making it the 76th largest in the world. The population density is highest in the southwest. French and Arabic are official languages. Major ethnic groups reported include Sara, Kanembu, and Arab. The majority of the population is Muslim, with large Protestant and Roman Catholics minorities. The official languages of Chad are French and Modern Standard Arabic, although Chadian Arabic is the most widely spoken language in this country. Chadian Arabic is spoken by between 40% and 60% of the population and is considered the lingua franca of the region. French is primarily used by the government and is a remnant of the French colonial era. It is spoken by around 1.6 million people, while Modern Standard Arabic is spoken by around 615,000 individuals. In addition to these languages, Chad is also home to around 125 indigenous languages which belong to one of the following language families: Afro-Asiatic (primarily within the Chadian subgroup), Nilo-Saharan, and Niger-Congo. Two of the languages spoken here are considered creole languages: Sangho (an African-based language) and Babalia Creole Arabic (developed from Arabic and Beraku). Individuals planning a trip to Chad should brush up on some basic Arabic phrases and if planning to stay in the capital N’Djamena, learning some French phrases could be useful. The dialing code for the country is 235. Chad is an independent country. It gained independence from France in 1960. Its constitution was last ratified in 1996. The government of Chad is carried out under a presidential republic system, which means the citizens of this country vote for individuals to represent their interests in government. As a presidential system, the President also acts as the leader of the country by serving as both the Head of State and the Head of Government. The person in this position is elected to serve a 5-year term with no term limits. Legislative actions are the responsibility of Parliament, which is a unicameral body that is made up of the 155-seat National Assembly. This body is dominated by the Patriotic Salvation Movement, which holds 88 seats and is considered the same party as the President. Additionally, the National Rally for Democracy in Chad holds 6 seats and is considered to be a party of the government as well. The President of Chad appoints the highest individuals of the judicial branch. Representatives of the National Assembly meet in the Building of National Assembly, which is located in the capital city N’Djamena. Factoring in Purchasing Power Parity, Chad's GDP is $30,590,000,000.00 (USD) with $2,600.00 (USD) per capita. This makes it the 129th largest economy and its citizens the 188th richest in the world. The currency of Chad is the Franc (XAF). Its major export partner is the United States. Its main exports are oil, livestock, and cotton. Its major import partners are France, China, and Cameroon. Its major imports include machinery and transportation equipment, and industrial goods. The current flag of Chad is a tricolor design that is made up of 3 vertical stripes of equal measurement. 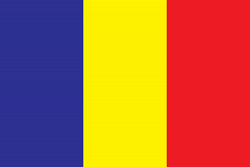 From left to right, the colors of the flag of Chad are: blue, gold, and red. This design was officially adopted on November 6, 1959, approximately 1 year after Chad earned its independence. When Chad first achieved independence on November 28, 1958, it continued to use the flag of its colonial government, the French Tricolor. A few months later, the government of Chad designed a new flag that used the pan-African colors of yellow, green, and red. When the legislative body learned that this design had already been adopted by Mali, it moved to change the flag to its current design. The current tricolor flag of Chad is known simply as the National Flag. Each of the colors represented on its background has a meaning that is unique to this country. The blue stripe stands for the sky and the hope held by the citizens of Chad, the gold stripe stands for the hot sun and desert habitats found here, and the red stripe stands for the fight for independence and the unity of the people of Chad.